Tiny pitch invader interrupts Southern Counties East Football League clash. A dog interrupted Tunbridge Wells vs Chatham Town when it ran onto the grass and had to be chased off by a number of the players before the game could continue. The hosts were defeated 3-4 in a thrilling Southern Counties East Football League clash at the Culverden Stadium in Kent on Saturday, in front of an attendance of 505. 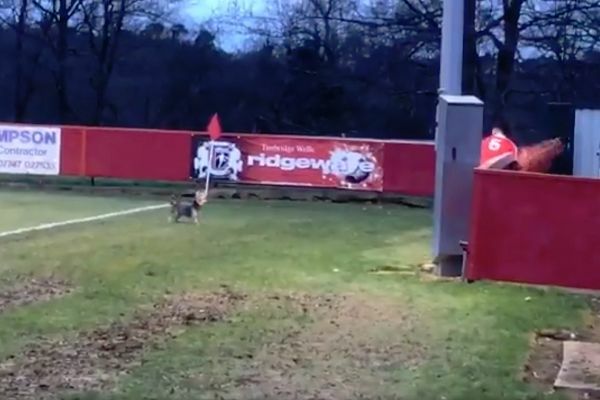 The match was brought to a halt when what looks like a Yorkshire Terrier started running around near one of the corner flags. Several of the Tunbridge Wells team try to guide the tiny dog pitch invader towards the exit while it bounds joyfully among them. Eventually the Yorkie is encouraged to leave and play can resume. Two late goals from the visitors turned the game around and earned an away win for Chatham.